If you are beginning to dive into building out your Smart Home then you will probably start out with a hub which controls all of the smart home products. The second purchase that many smart home enthusiasts make after purchasing their hub is a light bulb that is controllable via the hub. Until recently, smart LED bulbs have been too far out of reach for consumers to afford for replacing a few bulbs around the house. Only a year ago, did smart bulbs cost upwards to $30 just for a single bulb to be controlled via a hub and today with Cree’s Connected LED bulbs the price has been dropped down to $14.99. While yes, $14.99 is still 40% more than the traditional LED bulb, it does include all of the technology needed to make your home smart, well with the hub of course. 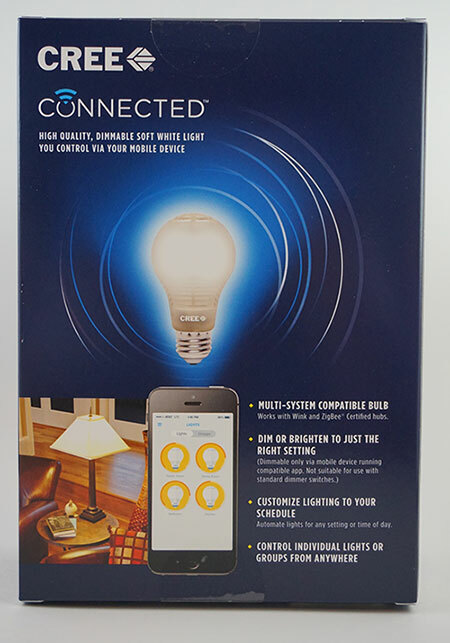 The CREE LED Connected Bulb that we are looking at today is a direct replacement for 60 watt bulbs that you have in your home today but also includes the technology within it to make it smart. Not only is the technology there to make it smart, it’s also an instant-on bulb which makes it great for places where you need instant lighting and not having to wait for the bulb to “warm up”. It also has a brightness of 815 lumen’s, 25,000 hours of lifetime, and is estimated to only cost about $1.64 a year to run. Continue on to the next page and we’ll unbox the CREE Connected LED Bulb! Previous : Are You Being Blackmailed As Result of Ashley Madison Leak?